"What Is It That Makes Up a City? provides the reader with an intelligent perspective on the strange culture of our times and a series of adventures through which we explore universal human problems. Family, education, the media, popular culture, technology, alienation, financial power or the lack thereof . . . These are among the most prominent components of the eight stories which comprise this book, in which characters struggle—sometimes in despair, but usually with a sense of humor—to understand or at least accept their place in a world that often makes no sense. " 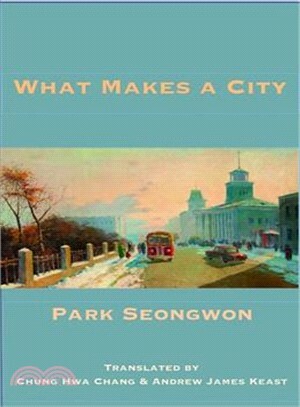 "Seong-won Park was born in Daegu in 1969. He made his literary debut with a short story called “A Will”, which was published in Literature and Society (Munhak gwa Sahwoe) in 1994. His first book of short stories, Disorder, Yi Sang, Ideal, was published in 1996, and Steal Me, his second collection, came out in 2000. In 2003, he was honored with the award for “Young Artists of Today” in literature, and he published his third book of short stories, We Are Running, in 2005. What Is It That Makes Up a City? is Park’s fourth collection, published in 2009. His fifth and most recent collection, In the Course of a Day, was published in 2012. ""Chang Chung Hwa has been engaged in literary translation since 2007. Her first published work, Su-ah Bae’s story, “Time in Gray”, was released by Asia Publishers in 2013, and she was honored in that same year by Modern Korean Literature Translation Awards, held by The Korea Times, for her translation of Seong-won Park’s story “By Motor-Home to Ulan Bator”.Since 2007, Andrew Keast has been working with Chang Chung Hwa on the translation of Korean literature. His efforts were recognized in 2013 by the Modern Literature Translation Awards, held by The Korea Times, and the same year saw Asia Publishers’ release of his first published work."